linkage. The shift fork sets in a groove cut into the synchronizer sleeve. The linkage rod or shifting rail connects the shift fork to the operator's shift lever. As the lever moves, the linkage or rail moves the shift fork and synchronizer sleeve to engage the correct transmission gear. 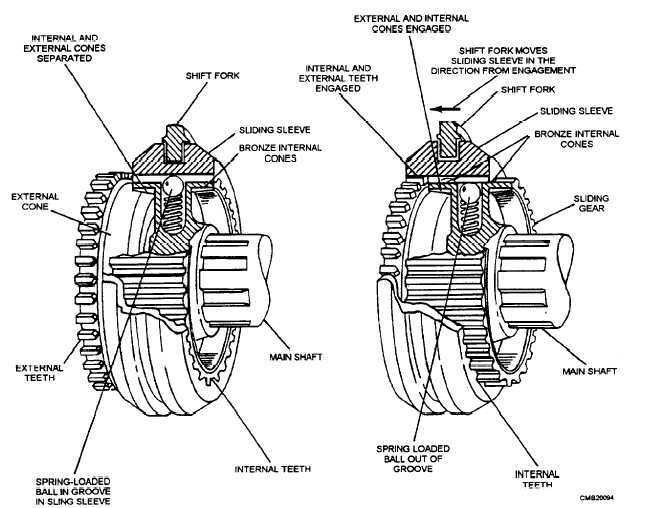 There are two types of shift linkages used on manual transmissions. They are the EXTERNAL ROD and the INTERNAL SHIFT RAIL. They both perform the same function. They connect the shift lever with the shift fork mechanism. The transmission shift lever assembly can be moved to cause movement of the shift linkage, shift forks, and synchronizers. The shift lever may be either floor mounted or column mounted, depending upon the manufacturer. Floor-mounted shift levers are generally used with an internal shift rail linkage, whereas column-mounted shift levers are generally used with an external rod linkage. The sliding gear transmission has two or more shafts mounted in parallel or in line, with sliding spur gears arranged to mesh with each other and provide a change in speed or direction.